Each one of 16 adult pet dogs watched a video where a human actor stood between two empty plastic flowerpots, greeted the viewer, and then turned to one of the pots. As the dogs watched, a video camera recorded the movements of their eyes to see if they would also look at the pot that the human was observing. A similar method has been used to test whether or not human babies who have not yet learned speech can still understand the intent to communicate. After all, current research suggests that dogs have a social intelligence similar to that of humans from half a year to two years old. Before the human in the video looked at one of the pots, she greeted the dog in one of two ways. In the "ostensive-communicative" condition, she used the classic standby when greeting something cute: a high-pitched voice, direct eye contact, and a cheery "Hi dog!" (Both children and animals are more likely to respond to a high-pitched voice, which explains why we can't stop ourselves from cooing and babbling baby talk at cute creatures.) Under the non-ostensive condition, the actor opened the video with the same words, but spoke in a low voice and avoided eye contact. While the first scenario carries a clear message of direct communication, the non-ostensive one implies that the human has no intention of sharing information with the viewer. "Gaze-following behavior among humans is an early emerging pervasive response and is frequently considered as a window into social cognition of different nonhuman species. For instance, dogs have a robust ability to share attention with humans, and they are very skillful in using human gaze in object choice situations. Dogs are sensitive to the direction of human visual attention and are skillful users of human directional signals that have potential referential significance. Moreover, increasing evidence suggests that dogs show early and infant-like sensitivity to cues that signal the human's communicative intent." Although these cues include both the communicative greeting's high voice and its eye contact, the researchers also point out that the dogs might be responding to these cues themselves, not to the communication that they represent. Specifically, the dogs might just be following the human gaze because of the initial eye contact and their own sensitivity to others' visual attention. The social environment in which pack animals like dogs – and primates – live requires that each member of the group have at least some awareness of what the others are paying attention to. 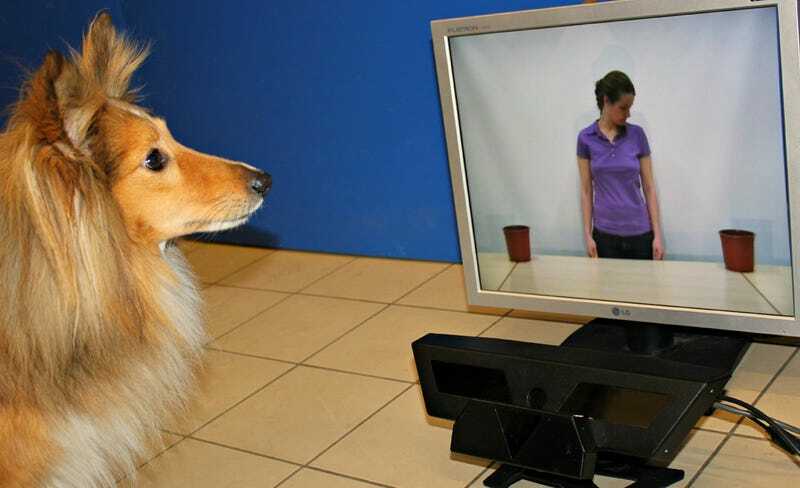 The researchers say, "Besides the susceptibility to human ostensive cues, dogs' gaze-following behavior may also be considered as a socially facilitated orientation response with aspects linked to associative understanding of the net utility of the co-orientation with others." So if you're hoping for a heart-to-heart with Fido, look him in the eye first. And don't forget your baby talk. Aaaww, who's a good boy?